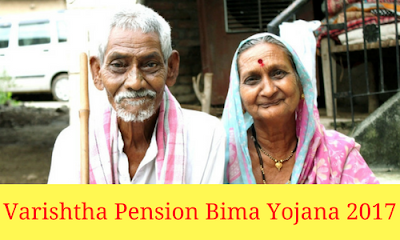 On January 24, 2017 the Union Cabinet has given its post-facto approval to launch Varishtha Pension Bima Yojana 2017 (VPBY 2017) which will be launched as part of Government’s commitment for financial inclusion and social security. Also it will be implemented through Life Insurance Corporation of India (LIC) during the current financial year. The main purpose of this scheme to provides social security during old age and protect elderly persons aged 60 years and above against a future fall in their interest income due to uncertain market conditions. The differential return would be borne by Union Government, which is the difference between the return generated by LIC and the assured return of 8% per annum as subsidy on an annual basis and one can choose to receive pension monthly, quarterly, half yearly or annually. Minimum age for investment is 60 years and there is NO Maximum age for entry. Minimum investment is not yet specified but Maximum Investment limit is Rs 7,50,000. The plan is available for only 1 year from the date of launch and the interest paid would be added to the income and taxed as per income tax slab.